The Student Success Center is the recipient of the annual Excellence in Assessment Award. The award, presented each year by the Office of Institutional Effectiveness, goes to the Student Affairs unit which best fulfills four main areas of assessment – the establishment of goals and objectives pertinent to their mission, the creation and use of measurements to test those goals, the collection and reporting of results, and the use of those results for implementation of constant continual improvement. 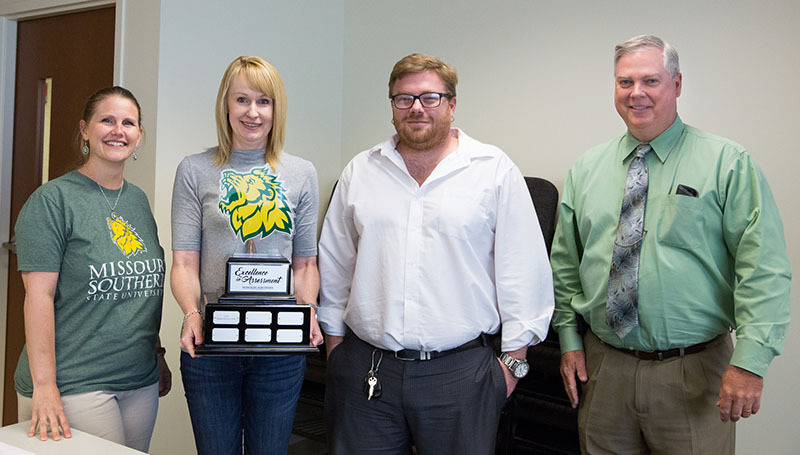 The center, which offers classes and other services to help meet students’ academic needs, received a traveling trophy as well as $1,000 to be utilized to advance student learning. The center was noted for having used assessment in a number of ways to improve how students receive services on campus, including work to centralize and improve tutoring services. Collaborative relationships have been developed with Athletics, Distance Learning and the School of Business, allowing them to use a centralized tracking system, tutor training and certification, and other Student Success Center offerings. “To us, assessment is definitely a group project,” said Stephanie Hopkins, director of the Student Success Center. We all work together as a team on our (documentation) reports.